Suzuki France has commissioned Tuning Formula to create a limited edition Bandit 1200 called the Alcatraz. The Bandit’s two handlebar clamps are replaced with a one-piece alloy clamp, which is engraved with the machine’s unique serial number, from one to 250. 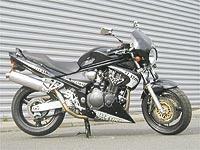 It has flat handlebars with new alloy balancers at each end, which both bear an engraved Suzuki " S " logo. The French have also used alloy for the rider’s footpegs and there’s a foot protector, which is machined into the shape of Suzuki’s logo. There are some practical features as well. The firm has fitted a new, exclusive, exhaust system, half-fairing and lower cowling. There’s also a screen to deflect some of the wind blast. And there’s crash protection on the engine. The machines were sold for £5900, which is £900 more than the standard bike’s list price in France. Tournois added: " The bike has been a big success and there is lots of pressure on us from our dealers to make another limited edition in the future. " Sarah Burton from Bandit Mania, a specialist shop in Lincoln, which is also the base of the UK owners club, said: " We think the Alcatraz looks absolutely stunning.
" One of our members in France has seen it and says it’s the absolute proverbials. A lot of people are wondering why it’s not available here, because it’s a cracking looking bike. " Bandit Mania had looked into the idea of buying the parts and making its own version of the machine, but Suzuki France owns the rights to all parts. It would take at least the clout of Suzuki UK to secure the release. A Suzuki UK spokesman said: " It’s gone well in France, but the markets are very different, so at this stage we can’t say one way or another whether we would sell something like it here. But we would obviously listen if people really liked the bike. " or make a posting in Talk Bikes, Talk News (see link, right).